About three week ago, I came back to my apartment to hear my roommates raving about Video Americain, a video rental store they had discovered through Towson University EMF faculty. 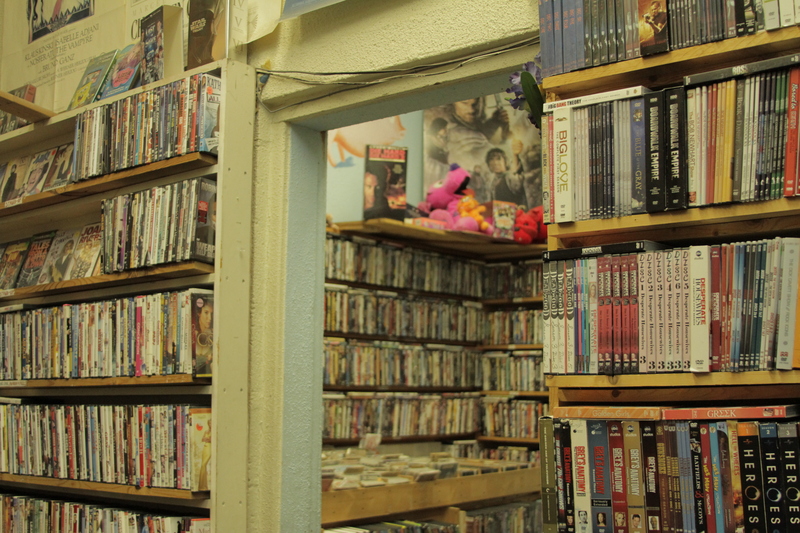 My roommate Devin, described the roadside attraction as, “a candy store for film nerds.” Their enthusiasm for what seemed to be a mom-and-pop video shop befuddled me at first, until he began to describe the rows of shelves organized, not by genre, but by directors. My mouth began to water as he talked about the previous Maryland Film Fest entries having their own section, featuring the works of local filmmakers I haven’t been able to find elsewhere. I was convinced this place was heaven on Earth and that I needed to stop by as soon as I saw an opportunity. 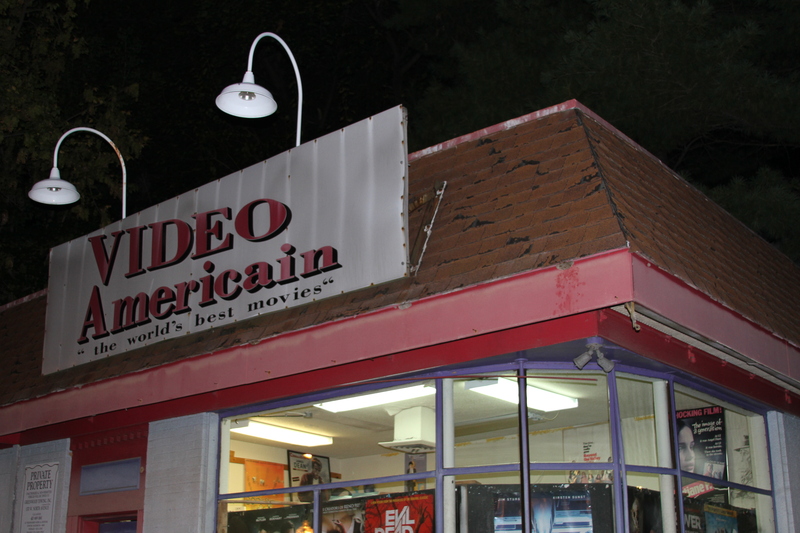 Video Americain’s storefront on Cold Spring Lane. So I was devastated to read that the store, a fixture of Roland Park for almost 25 years, will be closing early next year . I spoke with another friend of mine, a Towson alumnus named Zach Mullen, who made a stop into the store as soon as he heard the news. Speaking with the owner of the store, Zach enquired as to how he could help mobilize Towson’s film department to assist in saving the collection of 35,000 rare and obscure movie titles. Zach and I have remained in contact, working with the heads of the Electronic Media and Film department and the College of Fine Arts and Communication to see what space the school would have available in the hopes of housing the film library. Through Mullen’s talks with Video Americain, he discovered that the owners’ would like to sell the entire collection to one purchaser, who would in turn make the collection publicly available. Stacks of DVD’s leading to the VHS collection backroom. I got off class early Wednesday evening and was adamant about setting foot in the store for the first time. Not only did I want to see the collection I had heard and read about from numerous sources, but I wanted to see what I could do to help save it. As I pulled up to what I later found out was a renovated gas station, I realized that I had driven past the location once or twice before without thinking much of it. The store is incredibly unassuming. New and old movie posters line the floor to ceiling wrap-around windows on the east side of the building. The sign outside states, “Video Americain, The World’s Best Movies.” My immediate impressions were that it reminded me of the kind of seedy adult video store you’d see along the coastal highway of any touristy beach town. But I couldn’t have been more wrong about this treasure trove. Upon entering, you may be confused to find how small the store is. The floor to ceiling shelves, lined to the brim with DVD and VHS cases, close in on you claustrophobically. However, as you begin to navigate the maze like a lab rat searching for its prized cheese, you discover small, boxy room, after small boxy, room, all lined with rare, obscure, and out of print films. The sections range from foreign films in every world country to cult classics, serials from the 30’s and 40’s to forgotten straight-to-VHS tapes of the 80’s. I walked around for an hour, marveling at the beauty, dedication, and love it put into amassing this collection. Each room I entered surprised me with some new revelation, like discovering the films of Kenji Mizoguchi I hadn’t been able to find anywhere else. And not just one of his films, but a filmography of at least 10 of his greatest works. My happiest moment came when I passed the “new documentary releases” and saw that both Sarah Polley’s Stories We Tell and Amy Berg’s West of Memphis smiled down on me from the high racks. Both films had been released in the last month without me even knowing and I thought to myself how badly I wanted to see them. So rarely do I want to purchase such films; they almost never appear on Netflix and if they do appear at the Charles theater in Baltimore, it’s for a limited engagement of a week or so. To think that I could rent either of these difficult to find films for $4.50. Charlie Herrick, left, and Amanda Dorscy, right, man the counter for the Wednesday night shift. I was convinced that within 10 minutes of being there, this was a collection that needed to be saved. For 25 years it has been accessible to Baltimore’s viewing audience and to think that if, worst comes to worst, the library would be sold off one by one to private collectors, I would be disheartened. In speaking with Charlie Herrick and Amanda Dorscy, the employees working that evening, they noted that a few different groups have stepped up to help. Beyond the die-hard film buffs who come in on the regular, a group called the Baltimore Film Collective is working to find space to house and make publicly available the entire collection. Their main concern is doing so before the clock runs out on Americain’s lease and they are forced to begin selling off the collection film by film. For the sake of Baltimore’s incredibly active, arts loving community, I hope they are successful.